This example illustrates how to fit a piecewise exponential frailty model using PROC MCMC. Part of the notation and presentation in this example follows Clayton (1991) and the Luek example in Spiegelhalter et al. (1996a). The integral is the increment in the integrated baseline hazard function that occurs during the time interval . This formulation provides an alternative way to fit a piecewise exponential model. You partition the time axis to a few intervals, where each interval has its own hazard rate, . You count the and in each interval, and fit a Poisson model to each count. For illustrational purposes, a piecewise exponential model that ignores the patient-level frailties is first fit to the entire data set. The formulation of the Poisson counting process makes it straightforward to add the frailty terms, as it is demonstrated later. To obtain reasonable estimates, placing an equal number of observations in each interval is recommended. You can find the partition points by calculating the percentile statistics of the time variable (for example, by using the UNIVARIATE procedure). The DATA step reads in the Blind data set. At the first observation, it also reads in the Partition data set. The first ARRAY statement creates the int array and name the elements int_:. Because the names match the variable names in the Partition data set, all values of the int_: variables (there is only one observation) in the Partition data set are therefore stored in the int array. The next two ARRAY statements create arrays Y and dN, each with length 8. They store values of and , resulting from each failure time in the Blind data set. The first subject in _a experienced blindness in the left eye at time 46.23, and the time falls in the sixth interval as defined in the Partition data set. Therefore, Y1 through Y6 all take a value of 1, and Y7 and Y8 are 0. The variable dN# takes on a value of 1 if the subject is observed to go blind in that interval. Since the first observation is censored (status == 1), the actual failure time is unknown. Hence all dN# are 0. The first observed failure time occurs in observation number 4 (the right eye of the second subject), where the time variable takes a value of 31.30, Y1 through Y4 are 1, and dN4 is 1. The data set _b now contains 3,152 observations (see Output 54.14.2 for the first few observations). The Time and Status variables are no longer needed; hence they are discarded from the data set. The int_index variable is an index variable that indicates interval membership of each observation. The PARMS statement declares three regression parameters, beta1–beta3. The PRIOR statement specifies a noninformative normal prior on the regression coefficients. The RANDOM statement specifies the random effect, lambda, its prior distribution, and interval membership which is indexed by the data set variable int_index. Note that the term is omitted in the assignment statement because Y takes only the value of 1 in the input data set. 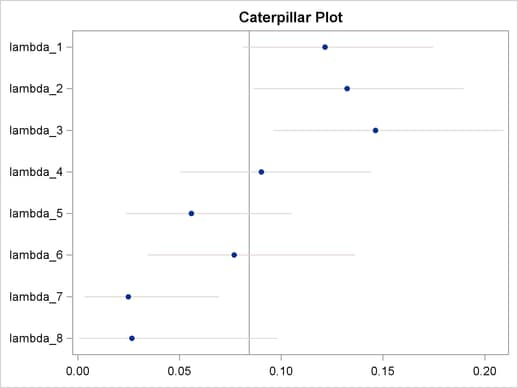 Output 54.14.3 displays posterior estimates of the three regression parameters. To understand the results, you can create a table (Table 54.45) and plug in the posterior mean estimates to the regression model. A estimate for subjects who received laser treament and had juvenile diabetes suggests that the laser treatment is effective in delaying blindness. And the effect is much more pronounced ( ) for adult subjects who have diabetes and received treatment. The fitted hazards show a nonconstant underlying hazard function (read along the y-axis as lambda_# are hazards along the time-axis) in the model. Now suppose you want to include patient-level information and fit a frailty model to the blind data set, where the random effect enters the model through the regression term, where the subject is indexed by the variable ID in the data. A second RANDOM statement defines a subject-level random effect u, and the random-effects parameters enter the model in the term for the regression mean, bZ. An additional model parameter, s2, the variance of the random-effects parameters, is needed for the model. The results are not shown here.